Because the Greeks in olden times applied the word Cactus to a prickly plant, Linnaeus, often called the Father of Botany, gave the same name to our wonderful American growth, and since his time these strange and varied plants have borne this nomenclature. We can hardly imagine any group of plants more interesting. There are over eight hundred varieties of curious and unexpected forms, bearing tubular or rotate flowers most varied in size and color-white, pink, purple, yellow, crimson, deep red-all beautiful and fascinating, and in our northern country protected in the conservatories. The Night-blooming Cereus is most renowned, most admired of all. The cacti are commonly found in the United States, in Mexico, and in South America, and some species are cultivated on the borders of the Mediterranean Sea, where the fruit is eaten. They vary in size from an inch or two in height to enormous growths of fifty or sixty feet (Cereus giganteus), which stand like telegraph poles, sometimes nearly bare, sometimes with many vertical branches, reminding one of a huge candelabra. 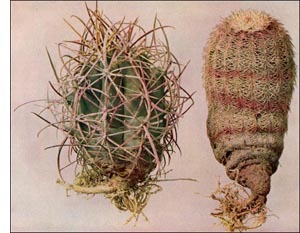 Then, again, some forms are nearly spherical, while others are long, jointed, and square; one species (Echinocactus visnaga) grows about nine feet in height, with a diameter of three feet or more, and a single plant of this species will sometimes weigh a ton. One of our most common forms is flat and broad. This, the Prickly Pear or Indian Fig (Opentia Vulgario), is the only species found as far north as Wisconsin and New York. As many of the cacti require but little care, they are quite extensively cultivated, not only for the rare beauty of their flowers, but for economic purposes. However, nearly all are worthy of culture because of their peculiar forms.